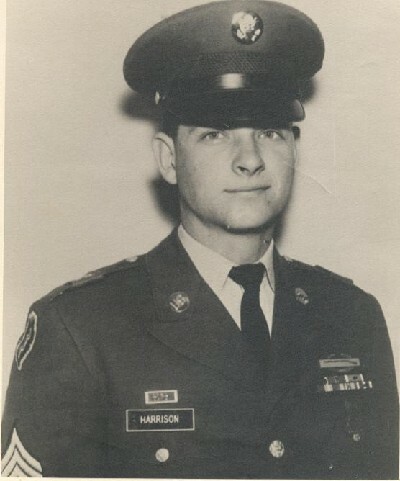 Larry Gene Harrison was born on January 3, 1948 and joined the Armed Forces while in Williamston, North Carolina. He served in the United States Army, Troop B, 1st Squadron, 9th United States Cavlary, 1st Cavalry Division, and attained the rank of Staff Sergeant. 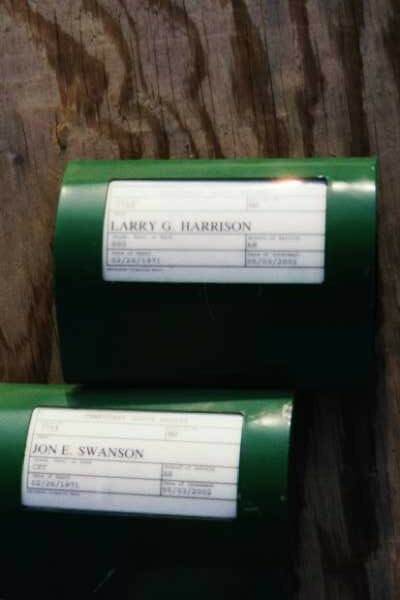 Larry Gene Harrison was listed as Missing in Action until 2002 when his remains were identified and buried with Captain Jon Edward Swanson in Arlington National Cemetery on 2 May 2002.
morning at Arlington National Cemetery along with his flyng partner, Staff Sergeant Larry Harrison, in a ceremony 31 years in the making. About 75 people, including Army Chief of Staff General Eric Shinseki, attended the funeral at Fort Myer Chapel near the grounds of the cemetery. 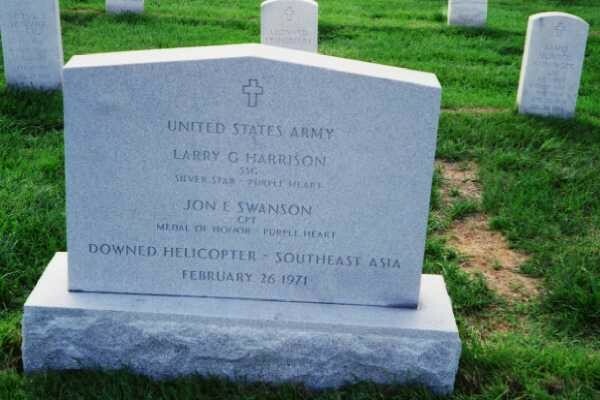 Swanson and Harrison's helicopter was shot down over Cambodia in early 1971 during the Vietnam War, and their remains were only recently recovered. Swanson's daughter, Brigid Swanson-Jones, was the only person other than the chaplains to speak at short service. She thanked the Army for taking care of its own and never forgetting them, even after three decades. body) has been done," she said. "I never knew people cared so much." The procession took a mile-and-a-half trip from the chapel to the gravesite on foot following the caisson drawn by white horses. Sandee Swanson said the family was told in February the remains had been recovered; however, due to the commingled condition of the bodies, separate burials would not be possible. 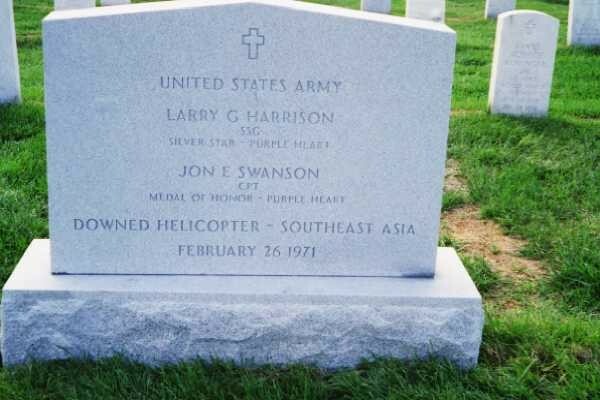 The Swanson family had no problems with the joint burial, though this is the first time a Medal of Honor winner — which Jon Swanson was posthumously awarded Wednesday by President Bush — has been jointly buried at Arlington National Cemetery. After 31 years without her husband, Sandee Swanson said the ceremony was tougher than she thought it would be. "It was very hard to make it through the ceremony. I was over come with a lot of different feelings and emotions," she said. The entire week, including a trip to the Oval Office, has been an incredible experience for her, she said. "This was a wonder tribute for a wonderful man," she said. Sandee Swanson, joined by her daughters Swanson-Jones and Holly Walker, who now lives in the Washington area, knelt beside the coffin after service had ended to say their final goodbyes to a person they had not been able to even say "hello" to in 31 years. SYNOPSIS: Jon Swanson was the pilot of an OH6A with Larry Harrison as observer on a visual reconnaissance mission, while providing close air support to an ambushed ARVN convoy in Kampong Cham Province, Cambodia. When the aircraft was flying at a low altitude marking enemy positions, it came under fire from two machine guns and was seen to burst into flames and crash. Another helicopter landed near the site, but was forced to take off when it came under heavy enemy fire. Repeated attempts by both ARVN ground troops and U.S. helicopters to reach the downed helicopter were thwarted by enemy fire. On February 27, U.S. helicopters returned to the area and saw what they believed to be two remains near the crash site. As late as March 7, the remains were observed near the crash site, but could not be recovered due to enemy fire. It was a common practice for communist troops to leave "bait" to lure other aircraft hoping to rescue downed aircrews into a hostile area. Because of the enemy presence in the area of the downed aircraft, it is possible that the bodies of Swanson and Harrison were used in this manner. Regardless, the U.S. Government believes that the enemy knows the fate of the two. Fifteen years after the war ended, the Cambodian government let it be known that they had the remains of nearly 100 Americans. Unfortunately, the U.S. has no diplomatic relations with Cambodia and would not officially respond. Although several U.S. Congressmen have attempted to recover the remains of these Americans, the government of Cambodia clearly wishes an official request from the U.S. Government, which it is unwilling to give. It is not thought that Americans captured by the Cambodian communists were allowed to survive, but were instead executed. As Vietnamese troops also coursed through Cambodia, as in Laos, however, a significant number of these downed pilots and crew might have been captured by the Vietnamese, thus escaping the post-war holocost caused by the Pol Pot regime in Cambodia. The governments of Laos, Cambodia and Vietnam have been less than forthcoming in response to reports that they still hold American prisoners. The U.S. has been unwilling or unable to obtain the freedom of any living prisoners since the war ended.